Music devices have undergone tremendous transformation and evolution, just like music genres have and the growth of technology has benefitted music industry by leaps and bounds. Previously, gramophones and cassette players were used till the 1990s, after which mp3 players, iPods and smartphones gained momentum are now extensively used in the 21st century. 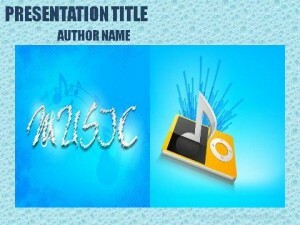 This Musical Devices PowerPoint Template has a blue dewdrop textured background, with the word ‘music’ in a cursive font and an image of an iPod playing music. The free music PowerPoint template can be used in seminars discussing the evolution of music and its devices in the past century. 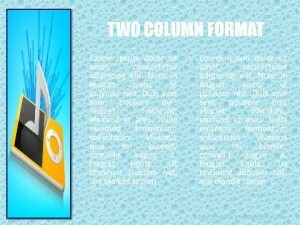 It can also be downloaded at vintage theme parties, with infotainment content in focus and also featured in music video jockey programmes to educate children, that expound on function of music devices’ functions and how they are now equipped with features like equalizers and presets that were once a very intricate handiwork handled by technicians two to three decades back.